Medicine and Technology: Would a really large iPod touch be the perfect medical tablet? Would a really large iPod touch be the perfect medical tablet? There are floating rumors about a really large iPod touch. I mean a screen that might be 7 or even 9 inches! Would such a device be the Newton Messagepad that everyone dreamed of several years ago when all the physician technologists carried one in our pocket? (Yes, I was one of them with my Apple Newton MP2100 in my white coat pocket and my MIT brass rat on my finger). I think it will really depend on the screen technology and the processing power. Add a touch screen or an active digitizer to the capacitive touch display, and you may have a great platform for most medical EHR/EMR software solutions. Plus, add the ability to run XP/Vista/Windows 7 and it will be a welcome addition to any doctor's office. However, I doubt that such a device would be called an iPod. Now you've built the Apple Tablet that would be a dual-boot Mac OS X /Windows with BootCamp. I think 2009 will bring some exciting new gadgets that will take healthcare to the next level. More clinicians will be comfortable using touch-screen devices and EHR/EMR vendors will be creating CCHIT certified solutions that will be leveraging all the advances in hardware such as SSD, faster processors, and unique screen input technologies. 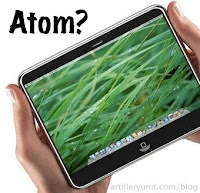 I'm very eager to see the Apple Tablet once it finally rolls out. Will we see it in 2009? I still miss using my Apple Newton Messagepad. At first glance, it looks useful. But during daily practical use, you will have a hard time holding a wide form factor like that. The iPod and iPhone can be securely clutched with one hand because your fingers wrap around. If you try to hold a device such as this with one hand, it will be secure at the thumb side but susceptible to slipping off at the other. You'd need to have one hand free if you want to touch the screen. Trying to write on it only makes that a greater possibility because additional downward pressure is applied.